Chairman, Vikrant Group of Institutions, Gwalior, M.P., India. Head, Research and Development, Tropilite Foods, Dawar Campus, Tansen Road, Gwalior, M.P., India. Emeritus Scientist, Cancer Hospital and Research Centre, Gwalior, M.P., India. Emeritus Professor of Biotechnology, Jiwaji University, Gwalior, India. Life Time Honorary Professor of Life Sciences, Bundelkhand University, Jhansi, U.P., India. Brief biography of Prof. Prakash S. Bisen, M.Sc., Ph.D., D.Sc. 	Academic Career: Prof. Bisen earned Ph.D in 1972 and was awarded D.Sc in 1981 After his postdoctoral work, he joined as Assistant Professor at Jabalpur University and was elevated as Associate Professor. He then joined at Bhopal University as a Professor of Microbiology in 1985. Prof. Bisen was Visiting Professor at Institute of Environmental and Biological Sciences, University of Lancaster, Lancaster, England and Visiting Research Professor at the Department of Biological Sciences, The University of Illinois at Chicago. He was U.S. National Science Foundation Fellow at University of California at Davis to work in the Department of Bacteriology on DNA recombinant technology. Prof. Bisen was WHO/ UNESCO Fellow for One Year at Institute of Microbiology, Czechoslovak Academy of Sciences, Budejovika, Praha, Czechoslovakia; UNESCO/UNDP/ICRO and Hungarian Academy of Sciences Fellow at the Institute of Plant Physiology, Biological Research Center, Szeged, Hungary. He is honoured with Life Time Professorship of Bundhelkhand University, Jhansi, India and with the highest award of the Bundelkhand University, Jhansi, U.P.. He is also Honorary Professor of Biotechnology at Jiwaji University and is currently pursuing his research in the field of Medical Biotechnology as Emeritus Scientist at Defence Research Development Establishment, Defence Research Development Organization, Ministry of Defence, Govt. of India, Gwalior, India. Professor Bisen is the external scientific advisor to a Barcelona (Spain) based multinational company Biokit involved in the manufacture of Diagnostic kits and also the Chief of Research and Development Centre of an upcoming industry M/s Tropilite Foods based at Gwalior involved in Food Biotechnology developing several innovative products for food industry. 	Prof Bisen guided sixty doctoral theses and has to his credit 175 publications in indexed International journals of repute. Over the years Prof. Bisen has been a leader in rapid tuberculosis diagnostics. He served as Director of a Technical Institute and Vice Chancellor of Jiwaji University, Gwalior, India. He is honorary advisor to a number of Technical Instituions in India. He had been the member of the University Grants’ Commission, New Delhi and Member Task Force, AICTE, New Delhi consultant to National Organisations. He served a member of Governing Council of National Accreditation and Assessment Board for Indian Universities/Educational Institutions. He was in the Board of Directors in the United States Education Foundation in India, Fulbright Foundation, Member, Governing Council, Indian Institute of Advance Studies, Shimla. Member, Governing Council of National Institute of Educational Planning and Administration, Member, Governing Council of Nuclear Science Center, New Delhi and Member of the Governing Council of CBSE, New Delhi. 	Award/ Fellowships: Among other awards and honours, Prof. Bisen had been recipient of Career Award of University Grants Commission, Indira Gandhi Fellowship, UNDP, UNESCO, WHO, International Cell Research Organisation (ICRO), US National Science Foundation Fellowship to work in US Universities as Post Doctoral Fellow; Govt of India Overseas Associate ship to work in USA, CSIR – CNRS Exchange Fellowship to work in Paris University, Paris, France and was a member of Indian delegation to visit Turkey, European Commission’s Marie Curie Fellowship to work in UK universities, DAAD (German Academic Exchange Fellowship). Recipient of Bundelkhand University’s Highest Honour in 2003 for his outstanding contributions in Biology. 	Scientific Society: Prof. Bisen is elected Fellow of National Academy of Sciences India for his enormous contributions in the field of biology. 	Patents: The diagnostic technology developed by Prof. Bisen’s group is unique in several respects and received wide applause from scientists working in the field of tuberculosis across the Globe. The technology was patented in India, US, Europe and in Japan. Other patent is under active consideration by Department of Biotechnology, Ministry of Science & Technology, New Delhi for financial support. He has published six international patents in US, Europe, Japan and India. A unique liposome based immunodiagnostic kit based on immunoblotting of anti-glycolipid antibodies and glycolipid antigen in patients body fluids, for early diagnosis of pulmonary as well as extra-pulmonary tuberculosis caused by Mycobacterium tuberculosis Strain H37Rv has been developed first of its kind in the world by employing a fourth generation blotting “Eastern Blotting” ( Bisen et al., 2003; Tiwari et al., 2005; Bisen and Tiwari US Patent No. US7,888,037 B2 (February 2011); Japanese Patent No. 4601628 (2006-553765) January 2011). Dececember 13, 2007 entitled Diagnostic Kit for detecting Pulmonary and Extrapulmonary Tuberculosis. 4. European Patent was published on 23 April 2008 vide patent No. 1716417 application No. 05718967.2 entitled “A Diagnostic Kit For detecting pulmonary and Extra-pulmonary tuberculosis” and also can be viewed esp@cenet database – worldwide. 3. Indian Patent Application # 1655/DEL/2012 dated 11.05.2012 “Process for the synthesis, fractionation and dry formulation of site specific mono pegylated interferon alpha molecule”. 3. Tiwari R. P., Anubhav Jain, Zakir Khan, Veena Kohli, R. N. Bharmal, S. Kartikeyan, Prakash S. Bisen. Cardiac troponin-I and T: molecular markers for early diagnosis, prognosis and accurate triaging of AMI patients. Molecular Diagnosis & Therapy (Springer) 6 16(6):371-381 DOI: 10.1007/s40291-012-0011 (2012). 5. Khan Zakir, Ram P. Tiwari, Noor Khan, GBKS Prasad and Prakash S. Bisen. Induction of Apoptosis and Sensitization of Head and Neck Squamous Carcinoma Cells to Cisplatin by Targeting Survivin Gene Expression. Current Gene Therapy 12, 444-453 PMID: 22974420, 1-10 (2012). 6. Bisen Prakash S Editorial on Marine Microbes: Unexplored Therapeutic Bio-mine. Jour Cancer Science and Therapy (OMICS Publishing Group USA) http:// dx. doi. org/ 10. 4172/1948-5956.1000e112 (2012) (Editorial). 7. Sharma Rohit, Bhagwan S Sanodiya, Deepika Bagrodia, Mukeshwar Pandey, Anjana Sharma and Prakash S Bisen. Efficacy and potential of lactic acid bacteria modulating human health. Int J Pharm Bio Sci 3(4) : (B) 935 – 948 (2012). 8. Pandey Mukeshwar, Surendra K. Chikara, Manoj K. Vyas, Rohit Sharma, Gulab S. Thakur and Prakash S Bisen. Tinospora cordifolia: A climbing shrub in health care management. Int J Pharm Bio Sci 3(4): (P) 612 – 628 (2012). 9. Sharma Rohit, Gulab S Thakur, Bhagwan S. Sanodiya, Mukeshwar Pandey, Prakash S Bisen. Saponin: A wonder drug from Chlorophytum Species Global J Res Med Plants & Indigen Med 1: 503–515 (2012). 10. Jarouliya U., Anis Zacharia Aniswh, Kumar P, Prakash S Bisen and GBKS Prasad. Alleviation of metabolic abnormalities induced by excessive fructose administration in Wistar rats by Spirulina maxima. Ind Jour Med Res 135: 422-428 (2012) . 11. Katare Charu, Saxena Sonali, Agrawal Supriya, Prasad GBKS and Prakash S Bisen Bisen. Flax seed: A Potential Medicinal Food. Journal of Nutrition & Food Science (OMICS Publishing Group USA), 2:120 doi:10.4172/2155-9600.1000120 (2012). 12. Bisen Prakash S, Bundela Saurabh S and Sharma Anjana. Ellagic Acid– Chemoprotective role in oral cancer. Journal of Cancer Science and Therapy (OMICS Publishing Group USA) 4:023-030.doi:10.4172/1948-5956.1000106 (2012). 13. Bisen Prakash S Editorial on “Enabling Oral Cancer Translational Research in India.” Journal of Cancer Science and Therapy (OMICS Publishing Group, USA) 4: i-i. doi:10.4172/1948-5956.1000e103 (2112) (Editorial). 20. Khan Z., Noor Khan, A. K. Varma, R. P Tiwari, Shahul Mouhamad, GBKS Prasad, P. S. Bisen. Oxaliplatin-mediated inhibition of survivin increase sensitivity of head and neck squamous cell carcinoma cell lines to paclitaxel. Current Cancer Drug Target (Bentham Science Publication, USA) PMID: 20578991 BSP/CCDT/E-Pub/00034:10, 660-669 (2010). 21. Baghel P., K. Naik, V. Dixit, A. K. Gupta, P. S. Bisen, G. B. K. S. Prasad, Indoor resting density pattern of mosquito species in Fingeswar block of Raipur district in Chhattisgarh, central India. Journal of Parasitic Diseases (Springer Verlag) DOI 10.1007/s12639-009-0014-3 ISSN 0971-7196 (2010). 25. Sanodiya B. S.,Thakur G.S., Baghel, R. K., Prasad G.B.K.S. and Bisen P.S. Ganoderma lucidum: A potent pharmacological macrofungus. Current Pharmaceutical Biotechnology (Bentham Science Publication, USA) 10: 717-742 (2009). 27. Pachauri Akash, Yadav Hariom, Jain Shalini, Bisen P. S., Chapperwal Anand, Marotta, Francesco, Minelli, E., Prasad G.B.K.S. Hypoglycemic effect of diabegon : A polyherbal preparation in normal and type 2 diabetic rats and human subjects. International Medical Journal (Japan International Cultural Exchange Foundation) 16: 117-124 (2009). 28. Bhadauriya P., Gupta R., Singh S. and Bisen P.S. NaCl induced metabolic changes in the diazotrophic cyanobacterium Anabaena cylindrical. 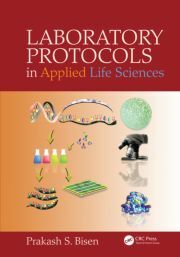 World Journal of Microbiology and Biotechnology (Springer Verlag, Germany) DOI: 10.1007/s11274-008-9879-z 25: 341-345 (2009). 29. Thakur G.S., Bag Manoranjan, Sanodiya B. S., Bhadouriya Pratiksha, Debnath Mousumi, Prasad G.B.K.S. and Bisen P.S. Momordica balsamina: A Medicinal and Neutraceutical Plant for Health Care Management Current Pharmaceutical Biotechnology (Bentham Science Publication, USA) 10: 667-682 (2009). 31. Jain A., Gour D. S., Bisen P.S., Prashant, Dubey P.P., Sharma D.K., Joshi B.K. and Kumar Dinesh. Single nucleotide polymorphism (SNP) in alpha-lactalbumin gene of Indian Jamunapari breed of Capra hircus Small Ruminant Research (Elsevier, The Netherland) doi:10:1016/j.smallrumres.2009.02.013 82: 156-160 (2009). 32. Khan Zakir, Tiwari R. P., Mulherkar Rita, Nand K. Sah N. K., Prasad G. B. K. S., Shrivastava B. R. and Bisen P.S. Detection of survivin and p53 in human oral cancer: correlation with clinicopathological findings. Head and Neck (Wiley InterScience) (www.interscience.wiley.com) DOI:10.1002/hed.21071, 31: 1039-1048 (2009). 33. Dixit, Vandana, Pati, A.K., Gupta, A.K., Bisen, P.S. and Prasad, G.B.K.S. Filarial infection is resisted differentially by subjects having different blood group phenotypes. Journal of Clinical Laboratory Analysis (Inter Science Wiley Publishers, USA) 23(3):186-191 (2009). 36. Jain, A., Gour, D.S. , Bisen, P.S. , Dubey, P.P., Prashant, Sharma, D.K., Bhargava, A., Joshi, B. K. and Kumar, D. Single strand conformation polymorphism detection inalpha-lactalbumin gene of Indian Jakhrana milk goats. Acta Agriculturae Scand Section A, 58: 205-208 (2008). 37. Bhadauriya P, R. Gupta, S. Singh and Bisen P.S. n-Alkanes variability in the diazotrophic cyanobacterium Anabaena cylindrica in response to NaCl stress. World J Microbiol Biotechnol (Springer-Verlag, New York Inc.) 24:139-141 (2008). 38. Gupta, R, Bhadauriya, P, Chauhan V S and Bisen P.S. Impact of UV-B Radiation on thylakoid membrane and fatty acid profile of Spirulina platensis . Current Microbiol. (Springer-Verlag, New York Inc.) 56(2):156-161 (2008). 39. Singh S.K., N.K. Sah and P.S. Bisen. A synthetic gag-p24 epitope chemically coupled to BSA through a deca alanine peptide enhances HIV-1 serodiagnostic ability by several fold. AIDS Research and Human Retroviruses (Marry Ann Liebert, Inc. Publishers USA) 23:153-160 (2007). 40. Dixit, Vandana, A.V. Subhadra, P.S. Bisen, B.C. Harinath and G.B.K. Prasad Antigen specific immune complexes in urine of patients with lymphatic filariasis. Journal of Clinical Laboratory Analysis (Inter Science Wiley Publishers, USA) 21: 46-48 (2007). 41. Dixit Vandana, Aswani Gupta, P.S. Bisen, G.B.K. Prasad and B.C. Harinath Serum immune complexes as diagnostic and therapeutic markers in lymphatic filariasis. Journal of Clinical Laboratory Analysis (Inter Science Wiley Publishers, USA) 21: 114-118 (2007). 42. Tiwari R.P., N.S. Hattikudur, R.N. Bharmal, S. Kartikeyan, N.N. Deshmukh and P.S. Bisen. Modern approaches to a rapid diagnosis of tuberculosis: Promises and challenges. Tuberculosis (Elsevier The Netherland) 87: 193-201 (2007). 43. Khan, F, A.K. Pandey, Manorama Tripathi, Sudha Talwar, P.S. Bisen, Minao Borkar and Suraksha Agrawal. Genetic affinities between endogamous and inbreeding populations of Uttar Pradesh. BMC Genetics doi:10.1186/1471-2156-8-12 8:12, 1-11 (2007). 44. Tiwari R.P., R.N. Bharmal, S. Kartikeyan and P. S. Bisen. Development of a rapid Liposomal agglutination card test for the detection of Glycolipid antigen in patients with Meningial, Pulmonary and other Extra-pulmonary tuberculosis. International Journal of Tuberculosis and Lung Disease (International Union Against Tuberculosis and Lung Disease, Paris, France):11(10): 1143-1151 (2007). 46. Mousumi Debnath, A.K.Paul and P.S. Bisen. Natural Bioactive Compounds And Biotechnological Applications Of Marine Bacteria. Current Pharmaceutical Biotechnology (Bentham Science Publication,USA) 8: 253-260 (2007). 47. Mousumi Debnath, C.P. Malik and P.S. Bisen. Clonal Propagation Of Chlorophytum borivilianum, An Endangered Medicinal Plant. Phytomorphology 57 :117-121(2007). 48. Raghuvanshi, R., S. Singh, R. Saxena and P.S. Bisen. Iron mediated metabolic regulations of growth in a diazotophic cyanobacterium Anabaena cylindrica. Physiology & Molecular Biology of Plants 13: 123-134 (2007). 49. Raghuvanshi, R., S. Singh, P.S. Bisen. Iron mediated regulation of growth and siderophore production in a diazotophic cyanobacterium Anabaena cylindrica. Indian Journal of Experimental Biology (CSIR, New Delhi) 45: 563-567 (2007). 50. Sah NK, Z Khan, GJ Khan and PS Bisen Structural, Functional and therapeutic biology of survivin. Cancer Letters (Elsevier The Netherland) 244: 164-171 (2006). 51. Singh S.K. and P.S. Bisen Adjuvanticity of stealth liposomes on the immunogenicity of synthetic gp41 epitope of HIV-1. Vaccine (Elsevier The Netherland) 24(19): 4161-4166 (2006). 52. Khan, Faisal, A. K. Pandey, P.S. Bisen and Suraksha Agrawal Allele frequesncy profile of three STR loci in nine north Indian populations. Jour. Forensic Sciences (Blackwell Publishing Inc.) 51(3): 706-707 (2006). 53. Garg S.K., Marilina B. Santucci, Miriam Panitti, Leo Pucillo, Marialuisa Bocchino, Fumikazu Okajima, P S Bisen, Cesare Saltini and M. Fraziano Does sphingosine 1-phosphate play a protective role in the course of pulmonary tuberculosis? Clinical Immunology (Elsevier The Netherland) 121: 260-264 (2006). 54. Gour, D.P.S., Geetu Malik, S.P.S. Ahlawat, A.K. Pandey, Rekha Sharma, Neelam Gupta, S.C. Gupta, P.S. Bisen and D. Kumar Analysis of genetic structure of Jamunapari goats by microsatellite markers. Small Ruminant Research (Elsevier, The Netherland) 66: 140-149 (2006). 55. Khan Zakir, Pratiksha Bhadouria, Radha Gupta and P.S. Bisen. Tumor control by manipulation of the human anti-apoptotic Survivin gene. Current Cancer Therapy Reviews (Bentham Science Publishers Ltd.) 2: 73-79 (2006). 56. Debnath Mousumi, C.P. Malik and P.S. Bisen. Micropropogation: A Tool for the production of high quality plant - based medicines. Current Pharmaceutical Biotechnology (Bentham Science Publishers Ltd.) 7: 33-49 (2006). 57. Tiwari, R.P., Dileep Tiwari, S.K. Garg, Ramesh Chandra and P. S. Bisen. Glycolipids of Mycobacterium tuberculosis Strain H37Rv Are Potential Serological Markers For Diagnosis of Active Tuberculosis. Clinical and Diagnostic Laboratory Immunology (American Society for Microbiology, Washington) 12: 465-473 (2005). 58. Khan Zakir, Pratiksha Bhadoria and P.S. Bisen. Nutritional and Therapeutic Potential of Spirulina. Current Pharmaceutical Biotechnology (Bentham Science Publishers Ltd..) 6: 373-379 (2005). 59. Gandhi Puneet, Zakir Khan, Prateeksha Bhadoria, Radha Gupta, N.K. Saha and P.S. Bisen. Origin and Expansion of Trinucleotide Repeats and Neurological Disorders. Current Genomics (Bentham Science Publishers Ltd.) 6: 563-568 (2005). 60. Pavitran, S., S. Balasubramanian, Pradeep Kumar and P.S. Bisen. Emulsification and utilization of high speed diesel by a Brevibacterium species isolated from hydraulic oil. World Journal Microbiol.and Biotechnol. (Springer- Verlag New York, Inc.) 20: 811-816 (2004). 61. Garg, K. Sanjay, Marilina B. Santucci, Seghrouchni Fouad, Cesare Saltini, P.S. Bisen, Vittorio Colizzi and Maurizio Fraziano (2004) Tuberculosis Therapeutics: Past Achievements, Present Road-Blocks and Future Perspectives. Letters in Drug Design & Discovery (Bentham Science Publishers Ltd.) 1:35-449 (2004). 62. Chauhan, V. S., B. Singh, S. Singh and P.S. Bisen. Regulation of Potassium Uptake in the Sodium-Resistant (NaCIr) and Thalium-Resistant (TICIr) Mutant Strain of Diazotrophic Cyanobacterium Anabaena variabilis. Current Microbiology (Springer-Verlag, New York Inc.) 46:59-64 (2003). 63. Bhargava, S., R. K. Saxena, P.K. Pandey and P.S. Bisen. Mutational Engineering of the Cyanobacterium Nostoc muscorum for Resistance to Growth-inhibitory Action of LiCl and NaCl. Current Microbiology (Springer-Verlag, New York Inc.) 47:5-11 (2003). 64. Garg, S.K., R.P. Tiwari, D. Tiwari, R. Singh, D. Malhotra, V.K. Ramnani, GBKS Prasad, R. Chandra, M. Raziano, V. Colizzi and P.S. Bisen. Diagnosis of tuberculosis: Available Technologies, Limitations and Possibilities. Journal of Clinical Laboratory Analysis (Interscience Wiley Publishers, Europe) 17:155-163 (2003). 65. Bisen, P.S., S.K. Garg, R.P. Tiwari, P. R.N. Tagore, R. Chandra, R. Karnik, N. Thaker, N. Desai, P.K. Ghosh, E. Volpe, M. Fraziano and V.Colizzi Analysis of shotgun expression library of Mycobacterium tuberculosis genome for immunodominant polypeptides: Potential use in serodiagnosis. Clinical and Diagnostic Laboratory Immunology (American Society for Microbiology, Washington) 10 (6): 1051-1058 (2003). 66. Pandey, P.K., R.K. Saxena and P.S. Bisen. Immobilisation results in sustained calcium transport in Nostoc calcicola Breb. Current Microbiology (Springer-Verlag, New York, Inc.) 44: 173-177 (2002). 67. Saxena, R.K., Pandey, P.K. and P.S. Bisen. Physiological and biochemical alterations in Anabaena 7120 cells under iron stress. Ind. J. Exp. Biol. (CSIR, New Delhi) 40:594-599 (2002). 68. Singh, S., P.K. Pandey, V.S. Chauhan, B. Singh, R.K. Saxena and P.S. Bisen. Nitrogen Metabolism in Cyanobacteria In: Phycology: Principles. Processes and Applications. Prof. A.S. Ahluwalia ed. Volume Daya Publishing House, New Delhi. Chapter 5:65-88 (2002). 69. Singh, B., V.S. Chauhan, S. Singh and P.S. Bisen. Physiological alterations and regulation of heterocyst and nitrogenase formation in Het- Fix- mutant strain of Anabaena variabilis. Current Microbiology (Springer-Verlag, New York Inc.) 45:315-322 (2002). 70. Singh, B., V.S. Chauhan, S. Singh and P.S. Bisen. Isolation and partial characterization of Het- Fix- mutant strain of the diazotrophic cyanobacterium Anabaena variabilis showing chromatic adaptation. Current Microbiology (Springer-Verlag, New York Inc.) 43: 265-270 (2001). 71. Chauhan, V.S., B. Singh, S. Singh and P.S. Bisen. Regulation of sodium influx in the NaCl- resistant (NaClr) mutant strain of the cyanobacterium Anabaena variabilis. Current Microbiology. (Springer-Verlag, New York Inc.) 42: 100-105 (2001). 72. Gothalwal, Ragini and P.S. Bisen Bioremediation In: Encyclopedia of Pest Management (Ed. David Pimentel) Marcel Dekker, Inc. pp.89-93 (2001). 73. Singh, B. B., I. Curdt, D. Shomburg, P.S. Bisen and H. Bohme Valine 77 of heterocystous ferredoxin FdxH2 in Anabaena variabilis strain ATCC 29413 is critical for its oxygen sensitivity. Molecular and Cellular Biochemistry (Kluwer Academic Publisher) 217: 137-142 (2001). 74. Sengupta, S., L.K. Sengupta and P.S. Bisen. Bioengineered Crops : The commercial and ethical considerations. Current Genomics (Bentham Science Publishers Ltd.) 2: 181-197 (2001). 75. Sharma, S.K., Singh D.P., Shukla H.D., Ahmad Anwar and P.S. Bisen. Influence of sodium ion on heavy metal-induced inhibition of light-regulated proton efflux and active carbon uptake in the cyanobacterium Anabaena flos-aquae. World Journal of Microbiology and Biotechnology (Kluwer Academic Publishers) 17(7):707-711(2001). Among other awards and honours, Prof. Bisen had been recipient of Career Award of University Grants Commission, Indira Gandhi Fellowship, UNDP, UNESCO, WHO, International Cell Research Organisation (ICRO), US National Science Foundation Fellowship to work in US Universities as Post Doctoral Fellow; Govt of India Overseas Associate ship to work in USA, CSIR – CNRS Exchange Fellowship to work in Paris University, Paris, France and was a member of Indian delegation to visit Turkey, European Commission’s Marie Curie Fellowship to work in UK universities, DAAD (German Academic Exchange Fellowship). Recipient of Bundelkhand University’s Highest Honour in 2003 for his outstanding contributions in Biology.